Our older version of FishTick, version 2.6.3, dates back to the late 1990’s and has been deployed at over 100 sites in Europe and the United States. The software consists of two programs. 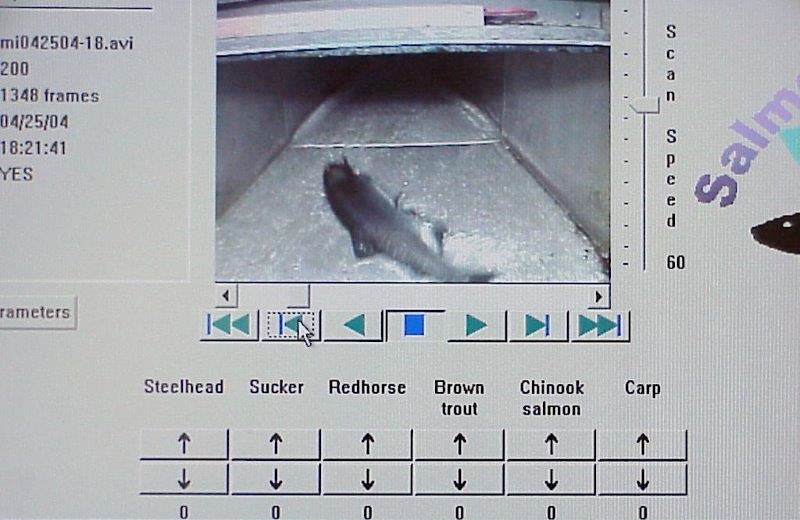 The first program, FishCap (Fish Capture), detects fish and writes the frames containing fish (or all fish if that option is chosen), to video files. 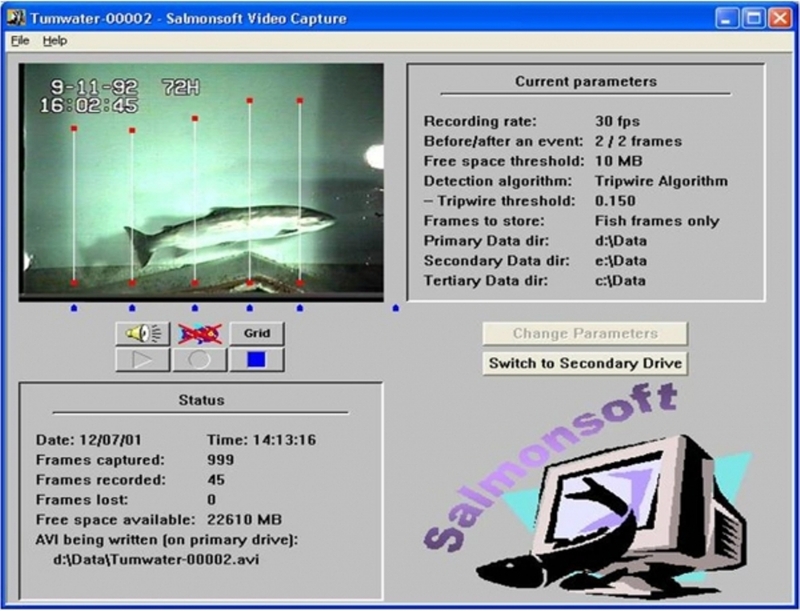 The second program, FishRev (Fish Review), allows the user to review the video file captured by the FishCap. The user can use FishRev to scan through the file of fish frames, identifying the species using either the mouse or user-definable short cut keys. The user can also capture date, time, and species for each fish passing and can also have summary data stored in a spreadsheet. FishCap has an extensive list of parameters which can be modified. The recording rate can be set from 1 to 30 frames per second, and the number of frames captured before and after a fish passage event can be set between 0 and 30. Currently three methods of detection are provided. The first detection method (used at fishwheel applications) allows the Capture program to start capturing when a switch is tripped and stops when the switch is tripped again. The second detection method (and the one shown) is the tripwire method where the user can place up to 25 tripwires on the screen and modify their length and location. A third detection method looks for moving objects based on user defined parameters and is normally better at reducing false detections caused by debris or turbulence in the water column. 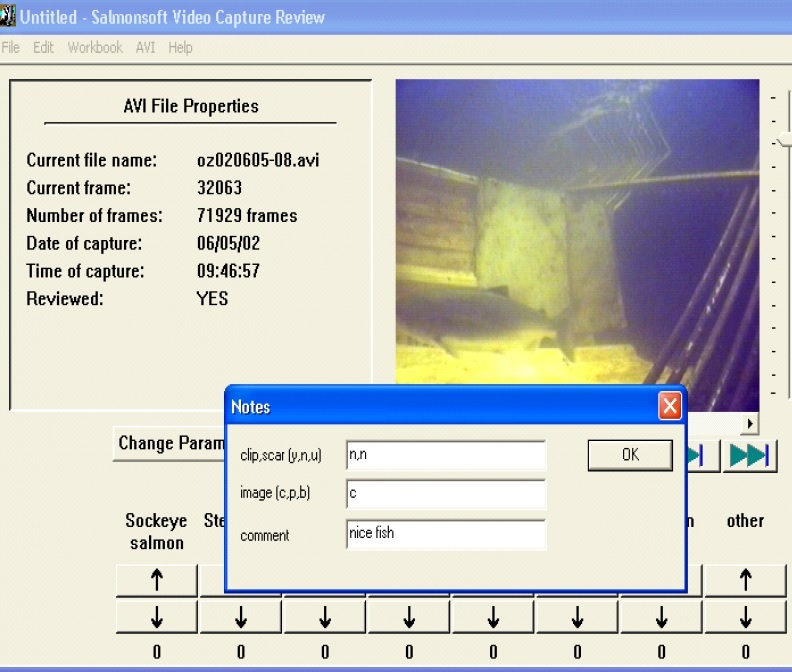 The user has the option of recording all frames or just those frames where fish are detected. FishCap can also automatically write a copy of the recorded video to a USB flash drive. This allows for easy download of video files. All a technician has to do is to remove the flash drive, replacing it with another flash drive, and bring the flash drive back to run the recorded video files through FishRev. FishRev allows the user to review video files created by FishCap. The user can scan backwards or forwards through this file at a speed ranging from 1/6 frame per second to 60 frames per second. 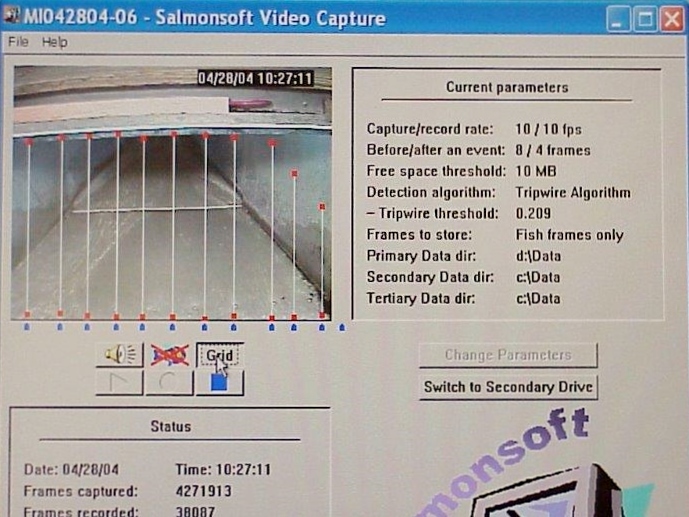 The user can also move frame by frame through the file or go to the next or previous fish detection event. All controls can be operated using either the mouse or user-defined shortcut keys. ave data on individual fish passage as well as summarized data in a spreadsheet. Below are more photos of the FishTick interface. We also developed an optional feature to record fish-specific information.